I tend to obsess over my cards, shifting things around and playing with the layout and design well after it needs any tweaking. So when I saw the 10 Minute Craft Dash Challenge - the challenge being to make a card in less than 10 minutes - I knew I needed to give it a try. I began by getting all my supplies out on my table: paper, embellishments, sentiment sticker, adhesive, border punch, trimmer. Then I sat back and thought about the design of the card. When I had a pretty clear idea in mind as to what I was going to do, I started the clock. Phew, I was sweating. I am not used to working under this kind of pressure. When my border punch got jammed, and my adhesive runner pulled the back off my paper (why?) I thought for sure I was not going to make it. But I pushed through and finished with only seconds to spare. Time to make: 9 minutes and 53 seconds. What an awesome challenge. It really forced me to focus and get down to business. I think what really made it work for me was having my materials at the ready before I started the clock and keeping my card design fairly simple. 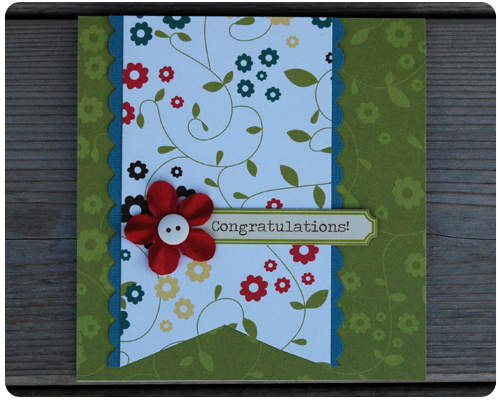 I am linking up my card over at the 10 Minute Craft Dash Challenge. This card turned out beautiful! You highlighted the colors perfectly and I love all those pretty flowers! Thank you so much for joining us in the 10 Minute Craft Dash. I hope you'll be able to join us again soon! Thank you Paulina. I had a lot of fun participating in this challenge and look forward to the next one! This is awesome. Love your patterned papers. Thanks for playing along with us in the 10 Minute Craft Dash and hope to see you again. Thanks Betty. I will definitely be playing along with this challenge again. So fun! This is so lovely - great papers and design. Thanks for playing with us at the 10 Minute Craft Dash! Very pretty! Great mix of patterned papers! Thanks Leigh. I love mixing patterned paper - it is my favorite technique. Thanks for reading. Love your bold patterns - mixing dp's scares me to death!!! Thanks for playing along with the 10 Minute Craft Dash. Thank you Caryn. I love mixing papers - it is my favorite scrapbooking technique. Thanks for visiting.